2016 was a strong year for Australian companies floating on ASX. The number of IPOs rose to 96 (from 85 in 2015), implying an average of eight per month or two a week – certainly enough to keep the most active investors busy... Though the absolute number of new floats increased, the market capitalisation at listing of these new ASX entrants was lower in 2016 than the prior year. Signalling a return to the smaller end of the market and, in the fourth quarter, a degree of ‘deal fatigue’ on the part of investors as many of the larger floats planned for this traditionally busiest quarter of the year were pushed into 2017. 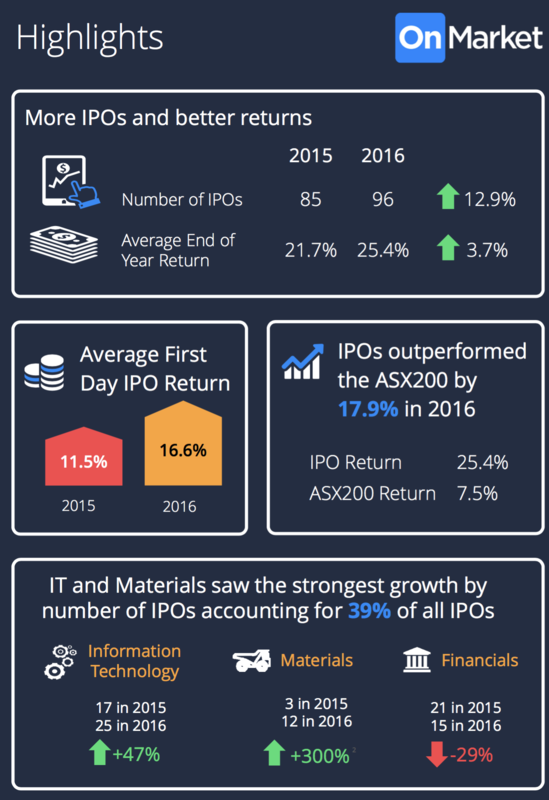 On performance, investors had little reason to complain on average: IPOs outperformed the ASX200 index by 18% and returned an average of 25% at year end. And more so because the best performance was seen at the smaller end of the market. New floats that issued less than $50 million outperformed those that issued more than $50 million by 17.5% at year end, an encouraging statistic for investors taking a portfolio approach to IPO investing. First day returns were also impressive and increased by 5% on the prior year, indicating either strong aftermarket support and a good investor following, or a strategy to leave some room for a price rise in the way new issues have been priced.